Pop Culture Lunch Box: Four Best Pizza Joints in the U.S.
04. Gino's East in Chicago. I'm a thin-crust man, but how can you not include this delicious place? You need a serious appetite to be able to eat any more than one of these pieces, but it's thick with flavor, and if you're lucky, you may get into a quality conversation with one of the locals about Ditka or Da Bearz. 03. 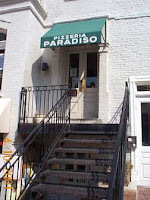 Pizza Paradiso in Washington D.C. I've always preferred the Dupont Circle location to the Georgetown one. The district may have a couple of contenders in Red Rocks in Columbia Heights and Roscoe's (see my last post). 02. Imo's Pizza in St. Louis and various other Midwestern locations. I may be biased since I worked here as a deliverer for four years in college, but then again, I've never gotten sick of this thin-crust masterpiece. The secret, believe it or not, is the provel cheese, kinda like how the secret to the Philadelphia cheesesteak at Pat's is Velveeta. The sweet creamy Italian house salad dressing is also phenomenal. 01. Grimaldi's Pizzeria under the Brooklyn Bridge. Thin crust. No need to even add details. Just go there immediately! If Grimaldi's was not number one then you would have lost credibility. Not sure where it would fit on the list but I have to give Pepper's Pizza in Chapel Hill some love. Delicious thin crust pizza in a great atmosphere. I was just in Chapel Hill two weeks ago and didn't go! I'm there fairly often, so I'll definitely check out your recommendation next time. Thanks. CM says check out Luzzo's at 211 First Ave., NYC. Unlike the touristy Patsy's, Luzzo's gives Grimaldi's a good run for the money in a fantastic row shop atmosphere. Good cheap italian wines to boot. Thanks for the advice, Dew. I think I went to Giordano's once but could never remember the name to go back again.